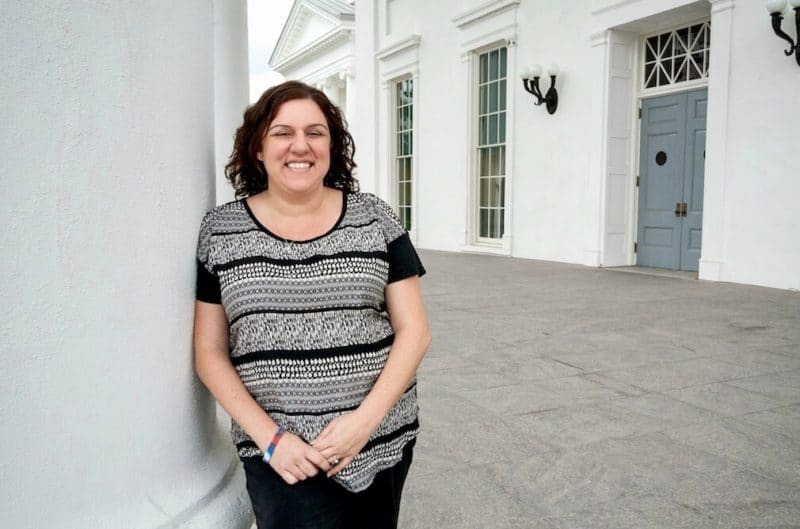 Jamie Liban, executive director of The Arc of Virginia, started working with people with intellectual disabilities (ID) and developmental disabilities (DD) in college. Jamie saw the issues people with ID/DD were confronting: underfunded services and support resulted in people living in large institutions or languishing on long waiting lists. These experiences led her to public policy advocacy. How far along are you in addressing the lack of affordable and accessible housing for people with intellectual and developmental disabilities (ID/DD)? to the services and supports they need to avoid institutionalization. We have coordinated meetings between families and people with ID/DD and public officials in order to facilitate understanding about affordable and acceptable housing needs. We have advocated for increased access to support services and rental subsidies. Virginia is currently developing a plan to increase independent living options for people with ID/ DD. The Arc has participated in the development of that plan. What are the barriers to integrated community housing? We have four very large, state-operated institutions. Many states have closed all of their state-operated institutions for people with ID/DD and serve people exclusively in community settings. This not only reduced the average costs of services (institutions are nearly three times the cost of community care); it protects civil rights of people with ID/DD. There are two pieces to the housing issue. People with ID/DD face extraordinary barriers accessing resources that provide affordable and accessible housing. This has mostly been due to the myth that people with ID/DD cannot live independently. Community integration is absolutely possible when supports are provided and the rent is affordable. The affordable-housing community is beginning to learn about the needs of this population and how to better serve them. However, it will take work to implement the action that is needed. Then there are the supports and services that help a person live in that affordable housing. For example, somebody may need help dressing or taking a shower. Other individuals may need financial management, safety supervision, and help with house maintenance. Unfortunately, there is a long waiting list. In Virginia, there are 8,700 people who are on waiting lists for disabilities services that would help them live in their community instead of an institution. Half of those 8,700 people are identified as being in urgent need —people who are living with aging or very ill caregivers, or maybe the urgent need is because an individual is aging out of foster care and literally has no place to go. In 2014, the state only provided help to 40 of these individuals and families. This inadequate response has intensified the crisis. The states that are doing it well are making sure that people with ID/DD are able to receive the support that they need well before the time when their caregiver passes away. We need to move toward more integrated services that help people truly have “a life like yours.” This is especially important when kids with ID/DD graduate from school. to arrange for the support to be available upon graduation so he/she can have a meaningful life in the community. What have other states done differently to be ahead of Virginia? They adequately fund the services. Virginia is ranked 49th in its fiscal effort toward ID/DD services. needs of those with ID/DD, people end up in institutions or on long waiting lists. We recently helped a young woman with Down Syndrome who is in her thirties, when she was about to be sent to a nursing home when her mother passed away. If an advocate hadn’t intervened and referred the case to The Arc, the young woman could very well be living in a nursing home for decades. People in their thirties should not be living in a nursing home for the rest of their lives. What can people do to support your efforts? Find a local chapter and become a member today. We need to advocate for those with disabilities. You don’t have to have a disability to help speak up for justice, and against injustice. It’s important for people with ID/DD and families to speak up about the crisis. It’s equally important for their neighbors, their friends, their colleagues, and their fellow congregants to speak up, as well. That’s when we’ll see the tides change. Does The Arc of Virginia have any partnerships with the private sector? Yes, the private sector is essential in helping us fulfill our mission. Individual and corporate support is often what enables advocacy and family outreach efforts. We have also built advocacy coalitions of 70-100 organizations on multiple issues. The private sector has been heavily represented in those coalitions. What are the success factors for a coalition that size? a civil right to be a part of and belong to their communities. It is the community that needs to help make that happen. That message reaches across a lot of lines. It is tempting to say money. On a broader, national perspective, it’s really about inclusion. We need to get to the point where the inclusion of those with intellectual and developmental disabilities is the fundamental value in our society. We need the overall community to be a voice for this movement. With a legacy of 60 years providing support to people with intellectual and developmental disabilities and their families, The Arc of the United States is a national organization with more than 700 state and local chapters.